Father Edwin Gariguez is a Catholic priest from the Philippines. He currently serves as the Executive Secretary of the National Secretariat for Social Action, the advocacy and social development arm of the Catholic Bishops’ Conference of the Philippines. He was awarded the Goldman Environmental Prize in 2012 for leading a grassroots movement against an illegal mining project to protect Mindoro Island’s biodiversity and its indigenous people. MANILA, Jun 17 2015 (IPS) - My country, the Philippines, is one of the most vulnerable to the impacts of climate change. Even though we are among those countries that hardly contributed emissions and benefited least from burning fossil fuels, we find ourselves at the frontline of the climate crisis. The catastrophe we experienced from Super Typhoon Haiyan [in early November 2013], one of the most powerful storms ever recorded, which killed thousands and damaged billions of properties, is proof to this. Almost two years later, our people are still struggling to recover from its devastating impact. It should therefore not come as a surprise that concern about climate change is higher in the Philippines than elsewhere. A recent public consultation showed that 98 percent of Filipinos are “very concerned” about the impacts of climate change, compared with a global average of around 78 percent. The Church cannot remain a passive bystander. It is our moral imperative to give voice to the voiceless. 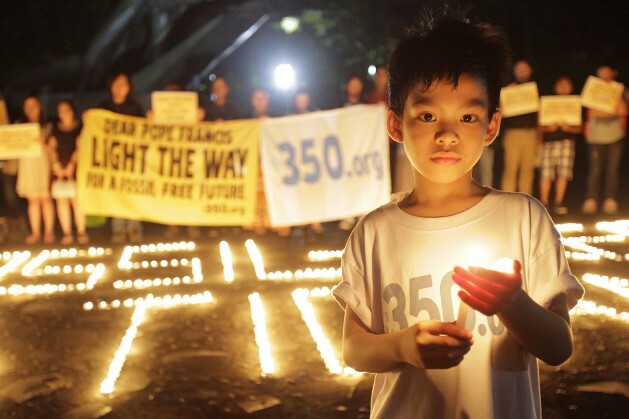 The Catholic Church in the Philippines has pronounced its strong opposition to coal mining because it will make our country contribute to climate change, and endanger ecosystems as well as the health and lives of people. Our churches have often led the struggles against dirty energy. In my hometown of Atimonan, Quezon, for example, more than 1,500 protesters led by church leaders staged a demonstration against a proposed coal-fired power plant last week. Similarly, Catholic priests in Batangas are at the forefront of the fight against the construction of a new coal power plant. Last month, about 300 priests held a prayer rally ahead of a committee hearing that discussed the project. Pope Francis also understands that climate change is not only an environmental issue but a matter of justice. His upcoming encyclical is anticipated to bring the link between climate change and the poor to centre stage. In the Philippines, we are grateful that Pope Francis came to visit and held mass in areas hit the hardest by Typhoon Haiyan. We admire him for standing in solidarity with us, using his position to inject momentum for faith communities around the world to take a moral stance on climate change. A papal encyclical is an extraordinary way to send a powerful message to world leaders whose actions to date lag far behind the scale of the response that is necessary. We hope that the Pope’s message will remind world leaders of their moral duty to act as we approach the climate summit in Paris [in December], where a new international climate agreement is supposed to be reached. The moral imperative to act could not be stronger and the world now needs to stand united in the face of the climate crisis that knows no geographic boundaries, while the worst impacts still can be avoided. Through the Pope’s encyclical, the Church will raise critical issues that need to be taken into account in the global response to this unprecedented threat. Global capitalism has lifted millions out of poverty by burning fossil fuels. On the flipside, it has also created vast inequalities and sacrificed the environment for the sake of short-term gain. Now is the time to break the stranglehold of fossil fuels over our lives and the planet. If it is wrong to wreck the planet, then it is wrong to benefit from its wreckage; a growing global movement to divest from fossil fuels takes this ethos at heart. The Pope’s critique of today’s destructive, fossil-fuel dependent economy will not go down well with the powerful interests that benefit from today’s status quo. But we, the Church and the people of the Philippines, will stand alongside the Pope as strong allies in the struggle for a socially just, environmentally sustainable and spiritually rich world that Pope Francis and the broader climate movement are fighting for. Your God Obomber restarts Bush’s oil wars and you bible thumping, Pope worshiping libs just goose step in the streets demanding Lord Obomber make the weather nicer and colder? Who’s the knuckle dragging, fear mongering bible thumping neocon now? Are you Goregressives now going to be pro life and anti gay now as well?